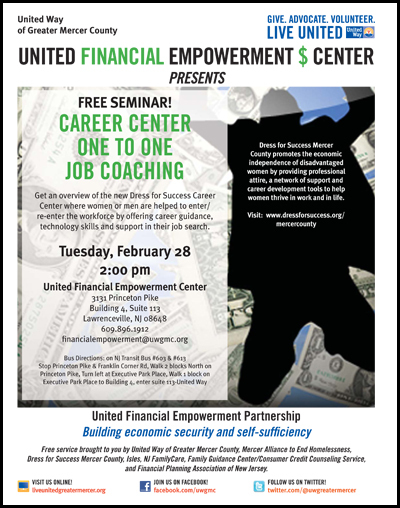 This presentation is an overview of the new Dress for Success Career Center where women or men are helped to enter/re-enter the workforce by offering career guidance, technology skills and support in their job search. Come learn about the services: The one-on-one career coaching, The Dress for Success suiting program for women and meet with a counselor after the presentation or schedule an appointment for another day. About Dress for Success Mercer County Dress for Success Mercer County is a non-profit organization that promotes the economic independence of disadvantaged women by providing professional attire, a network of support and career development tools to help women thrive in work and in life. The Lawrenceville office includes a boutique where clients receive custom suits and accessories, a Career Center offering guidance, technology and job search skills and a Professional Women’s Group for support and training. All services are provided free of charge to eligible clients with the goal of instilling confidence and professionalism. Since 2007 they have assisted 1600 women in central NJ. The organization is a member of Dress for Success Worldwide, with affiliates in more than 110 cities in 13 countries. To learn more, visit www.dressforsuccess.org/mercercounty. Connect on twitter @DFSMercer. Do You Need Health Insurance for Your Children? Come Find out about NJ FamilyCare. It may be the Answer! NJ FamilyCare offers free or low cost health insurance for uninsured children 18 years old or younger who live in New Jersey and certain low income parents. Children who are lawful permanent residents or in a qualified immigrant status may be eligible, regardless of their date of entry into the U.S. However, immigrant parents/guardians must have legal permanent resident status for at least five years to be eligible. NJ FamilyCare provides full health coverage through your choice of participating Health Maintenance Organizations (HMOs) and covers almost every healthcare need including doctor visits, hospitalizations, lab test, x-rays, eyeglasses, mental health services, prescription drugs and even dental care for most children. Eligibility for is based on monthly income and household size (which includes parents, stepparents, and children under 21). Income eligibility for parents/guardians is counted differently so it’s best to call for more information. Assets are not a determining factor and no one is turned down due to a pre-existing medical condition. It’s easy to apply online or download an application from the website at www.njfamilycare.org and mail it in. You can also pick up an application at an application assistance site near your home listed on the website under Need Help Enrolling. Our enrollment staff is available to answer your questions or provide additional information at 1-800-701-0710.